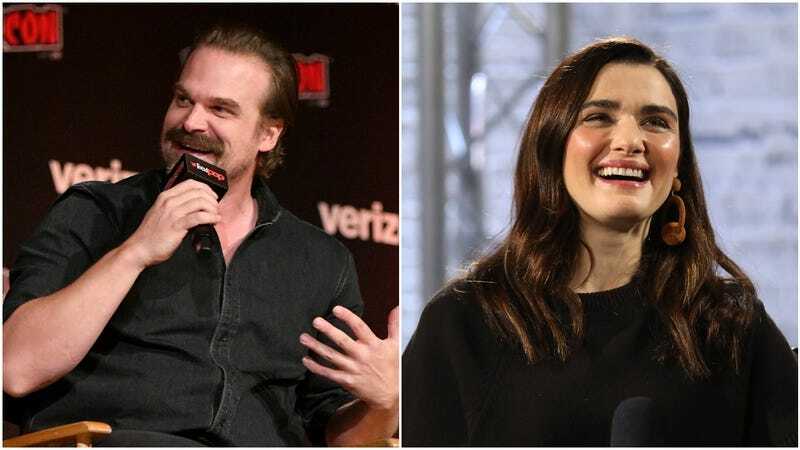 Stranger Things favorite David Harbour gets to claim another pretty major square on his bingo card of comic books-related gigs: Per The Hollywood Reporter, the actor will be making the jump from Dark Horse Comics’ Hellboy to Marvel Studios’ next superheroine feature, Black Widow. There is no word yet as to whether he will play a friend or foe of Scarlett Johansson’s Natasha Romanoff, but the film is slated to begin production this summer. Aside from Harbour and Johannson, the only other confirmed player is actress Florence Pugh. The budding cast could be joined by another major name sooner than later. According to a report from Variety, Rachel Weisz is also circling an undisclosed role for the film. If the deal closes, she and her castmates will be directed by Australian filmmaker Cate Shortland. Both Harbour and Weisz are are currently maintaining glowing careers. Harbour recently wrapped the action thriller Dhaka, in which he stars alongside another Marvel mainstay, Chris Hemsworth. Season three of Stranger Things also begins streaming on Netflix in July. Weisz is still understandably riding high off of her Oscar-nominated turn in The Favourite.